Released by The H. John Heinz III Center for Science, Economics and the Environment, another repors that reads like a disaster novel. Here is the summary about invasive species. 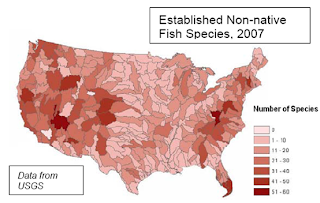 In 2007 there were only two watersheds in the lower 48 states without established non-native fish; most (58%) have more than 10 such species. Information about most other non-native species is not adequate for reporting at a national level.